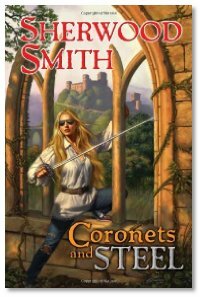 The setup for Coronets and Steel reminds me irresistibly of Marion Zimmer Bradley's Glenraven. Tho' to be honest. I think this is a better book with more realistic characters. And that is saying a lot when the plot involves identical cousins, magic, kidnappings, royalty, mysterious middle European countries and much daring do and plot twists. Kim Murray is in Vienna researching her family history when she is mistaken for her cousin Aurelia. And to recount anymore of the story would spoil the numerous plot twists and turns. But what is interesting about this book is that when I sat down to re-read it for this review; I found that knowing the plot didn't hurt my enjoyment of the book at all. Sure it was fun to be surprised during my first read, but the book is so well constructed that it still carries the reader along. The characters are also very solidly written, in particular the heroine Kim. Again, credibility can be hard to come by when your main character is masquerading as her identical cousin (who she has never met). Who is also, by the way, a wealthy princess. There is such a thing as too much wish fulfillment! But Kim's reactions and internal voice bring the scenario down to earth and allow us to engage with her and the other characters. While the book was very enjoyable as a stand-alone novel, a sequel called Blood Spirits is due this fall. And I'm sure to be on board with that book as well.